I was not born organized. I used to be late all the time; I lost my keys, lost my wallet; lost my shoes in the bottom of the closet. But I wanted to be organized, and living that way felt like failure to me. It's taken me years and necessity to get my world into a state of order that gives me calm. When you gain control over your time and spaces, you too can get to that place. I spent 18 years working in television production. In those years I learned, sometimes the hard way, that unless you are organized, you cannot get a show on the air on time and on budget. I had amazing mentors along the way who taught me time management, people management, and space management -- all while engaged in a creative enterprise. I left my career behind to take care of my kids. Becoming a parent, the disparate elements of my organizational style - disorganized personally, but organized professionally, came together in a hurry. As a parent, being organized provides for my kids' well being and my own personal sanity. I started my Northern Virginia-based business because I've come to like creating order out of chaos and making things work efficiently. I get true joy and satisfaction from seeing my skills improve lives. 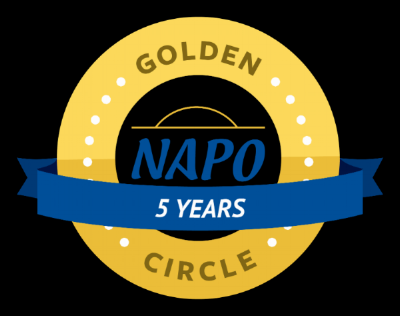 I'm a proud member of the National Association of Professional Organizers Golden Circle. READY TO TAKE STEP ONE? Getting organized, even with a professional, is not about trying to bring a Martha Stewart-like perfection to your world. It’s about making your world work for you, and not having your things and spaces control your time, energy and emotions. My goal is to help simplify your life, to streamline your daily effort. That's not about before and after pictures, but about your before and after feeling about whatever it was you wanted to change. Organizing is an educational process and I try to transfer what I know to you so that you not only get organized, but are able to stay that way. Everyone can be organized. Most people are in some areas of their life and less so in others. Together we figure out what is working for you and apply it to what is NOT. It's YOUR space, not mine. How will we make it work for you?